Facebook newsfeed is probably the most popular feed throughout the internet. Due to the character of the platform, every one of us has his own, personalized dose of the created content every day right at our fingertips. Recently announced changes will change the “personalized” factor into a “selective” one. How does your newsfeed look like? Have you ever tried to look at the people or pages you follow and ask yourself why actually are you looking every day on motivation videos from a “young entrepreneur from silicon valley” or why the “pretty” face of your high-school bully newborn just popped up for the seventh time since this morning? The ability of unfollowing certain people or pages, adding some to your favorites, and first of all the brilliant algorithm that chooses the right content from your likes based on your behaviors on Facebook is something that makes this platforms’ newsfeed unique. But new changes that will be made in the next few months can drastically change our experience on Facebook. The biggest social media platform founder is known to engage actions showing that he really cares (or want us to think that way) about our privacy, preventing disinformation, and more recently… our mental health. In the latest status update, he invokes numerous studies to support his team actions regarding the newsfeed algorithm. The point is that engaging in conversations with your close friends or relatives can be more beneficial than choosing a “Wrrr” reactions to add cockroaches to the Protein Shake that this guy on a live stream must drink in a moment. Long story short – LAD Bible videos and Tai Lopez posts from Wall Street at 4AM are really affecting your mental health, so Mark will show you more of the right-winged status updates of your friends and LIVE Video from your BFF pub crawl this week. It has been officially said, that organic reach of every content generated by businesses, different media or informative/entertaining pages will be effectively reduced. How can I still reach my audience? There are two ways left to still reach your customers after the changes. 2.Create content that will “engage conversations” and reactions. But not with a customer and your brand or page but between them. What kind of content can be considered as a good one? This is the only example pointed out in the article. We can only guess how the user engagement will be measured and how will your posts be displayed. Facebook also mentions something like “topics that start a conversation”, which we can perceive as open questions about important topics, that you will ask your audience. In this case, the platform algorithm will make an exception and will “promote” such content. When you really need to worry? Facebook points out that the impact on organic reach will be the biggest in those cases, and content like this will be considered as low-value. What is more – we can read in the statement, that your whole business page will be ranked by looking at your engagement, and profiles with a low score will be degraded in the newsfeed hierarchy. 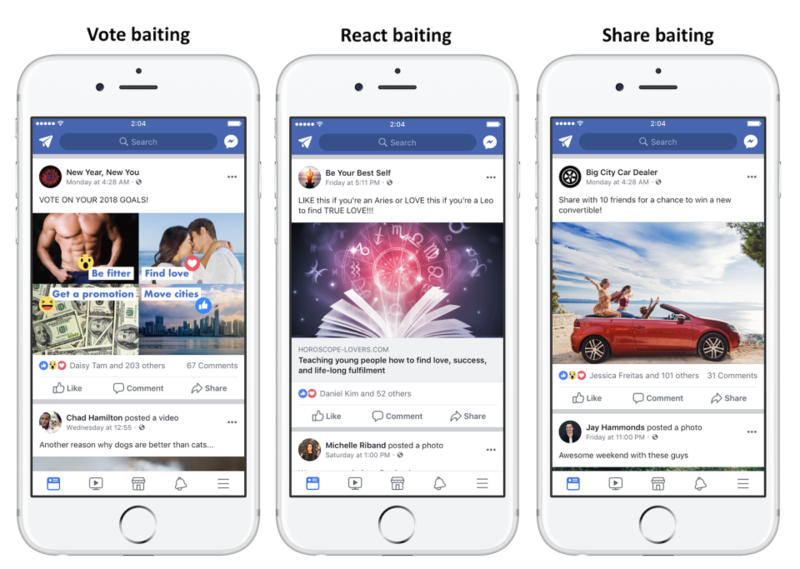 “Engagement bait” seeks to take advantage of Facebook newsfeed algorithm by boosting engagement in order to get greater reach. The platform has analyzed and categorized thousands of posts with “baits” and grouped them. 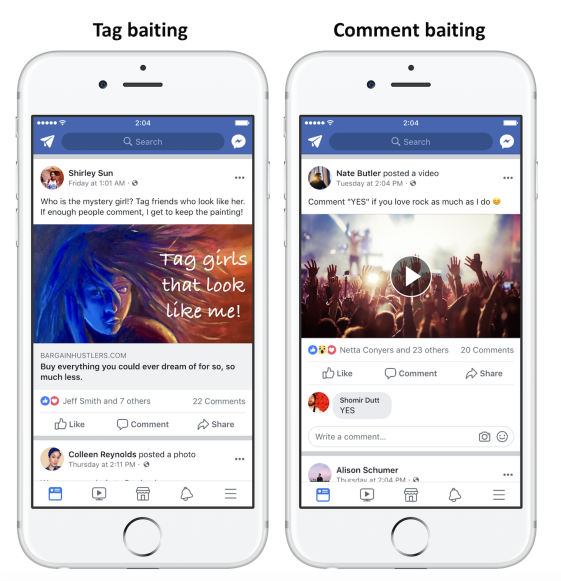 Machine learning model that can detect different types of engagement bait will automatically detect them, and posts that use this tactic will be shown less in News Feed. What kind of content are we talking about? Vote Baiting – every picture or video that is divided into some parts (usually 4) and user uses reactions to “vote” on one of the categories. Will this affect me directly? It doesn’t matter if you have a profile of a big company or a small, local band fan page, the changes will affect all of the users on Facebook. Follow the guidelines and try harder to create new conversations opportunities and quality content that people will react with. Previous article2018 New Years Resolutions for Social Media and MarketingNext article Schedule Facebook covers - new feature!